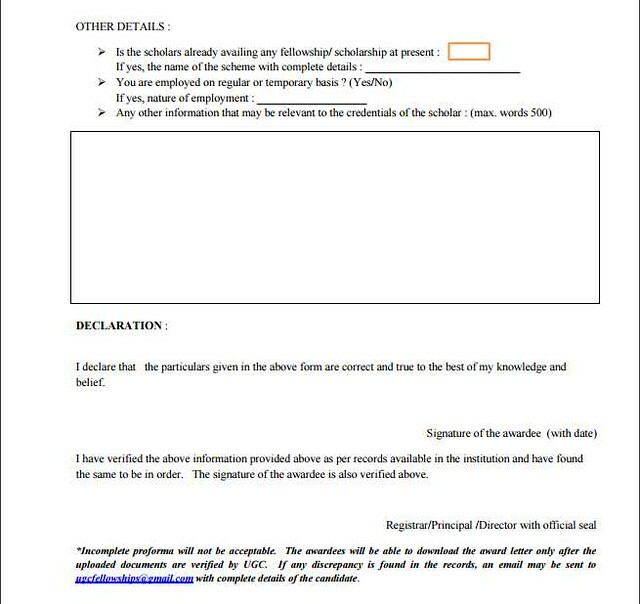 All those students who have received the Ishan Uday Scholarship have to upload the filled in Verification Proforma (VP). The form has to be uploaded online only and the candidates should not send the hard copy of the verification form to UGC. The verification form will be available on the UGC website under the NER section. The candidate has to go to the result section and enter the required details. In this part, the candidate has to fill basic information about himself. Fill in your Name, Gender, Date of Birth. Calculate your present age (Age in _Years _ Months and _Days as on the of filling application). Fill in the contact details. Paste your passport size photograph with a diagonal signature cutting it. Fill in the details as per your mark sheets in those levels and strike out those cases which are not applicable as per your mark sheet. Fill in the Registration Details of your University/Institute/College. The title of Research is not compulsory to write if your course does not have any research part. Fill in the details of the Institution which you have named in Part 2, 2nd point. Fill in the details of your course. 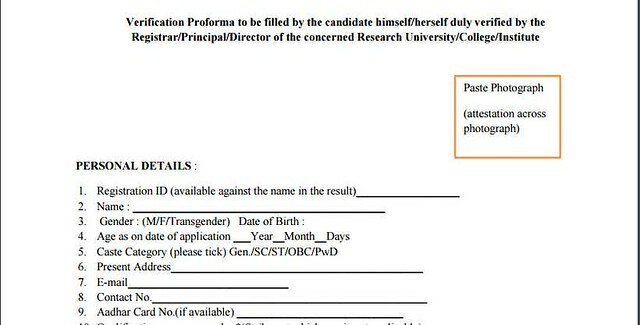 This part of the form should be filled after confirming the details with your college. Fill in the details as asked. Write any other relevant information which may be of use in the given box in no more than 500 words. 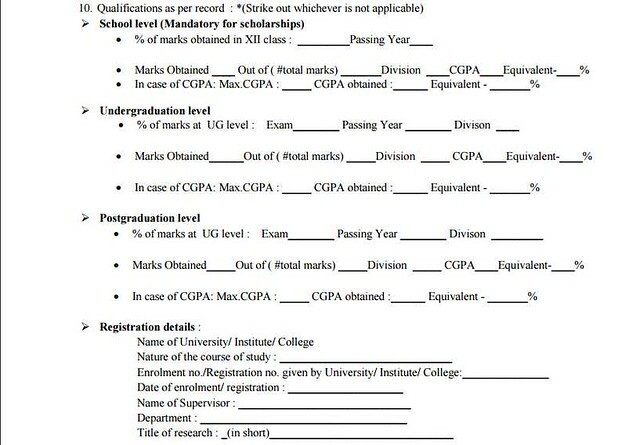 Get the form attested by Registrar/Principal/Director of your Institution. *You don't need to fill up UG, PG and registration details section (N.B. If you wish you can write 'Name of University/Institute College and Nature of the course of study in registration details section'). Just leave these sections blank. Fill up only Higher Secondary section. *Institution/Course Details- Ask your college principal or the concerned person. They will provide you with the institution information. They are running the college so they will know better what aid/fund the college is receiving and under what UGC Act the college is recognised. *Any other information that may be relevant to the credentials of the scholar (max. words 500) If college principal has something to say about you, he/she can write. Otherwise, this section can also be left blank. After filling up the form, create .pdf file(less than 500kb). After uploading your Verification proforma, UGC won't send any confirmation message personally in email or phone number. But if your VP is uploaded successfully then a message will pop up on the website itself stating your VP has been uploaded successfully. And next time when you log in, it will show a status stating your application is under process. And according to UGC website, you will be notified by email when your Verification Performa is verified by the concerned authority. So If it shows on UGC Website that your Verification proforma is submitted successfully then wait for your VP to be verified. You will be notified by email once your VP is verified. Use PDF compressing tools online like small pdf, Ilovepdf and you will be able to compress your file to the required size. You should try uploading the Verification form as soon as possible. Try doing it within one month of the announcement of result. As such no last date has been announced by UGC on their website. It will take some time for getting the award letter after you have successfully uploaded the filled in Verification form. You should put a no in the Employment category if you are not employed anywhere. You will receive the award letter after your form has been received and verified by UGC. The students should keep a screenshot of your computer/ laptop screen which states that the verification form has been successfully uploaded.